Home / News / Australian Says World Can Learn From Duterte Victory! Australian Says World Can Learn From Duterte Victory! 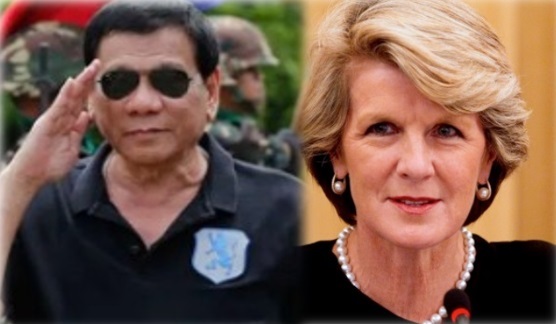 In an exclusive Rappler interview, The Australian Foreign Minister Julie Bishop said the world can learn from the unprecedented electoral victory of President Rodrigo Duterte, who vowed to eliminate day to day problems such as crime and traffic in the Philippines. "I think that President Duterte was responding to the concerns of the people of the Philippines, and the lesson for politicians around the world is to tap into the concerns, particularly of those who feel left behind by globalization, those who have been affected by the disruption of technologies, and those who fear change." Bishop said. "And we're seeing the consequences of that around the world, whether it's Brexit, the US presidential election, or even here in the Philippines. But we're also seeing outcomes in elections in Europe, so I think it's a phenomenon that will be with us for some time," Bishop added. Julie Bishop then described these times as "uncertain" and "restless", and said elected officials "have to respond to those concerns." According to Bishop, people need to share the fruits of globalization “more equitably”. "I think that is the challenge facing governments around the world, that while globalization and economic integration, economic competition, have undoubted benefits, more people need to share in those benefits," Australia's top diplomat said. She also stressed the threat of terrorism, particularly from the Islamic State (ISIS). "We are deeply concerned about ISIS and other terrorist organizations that carry out such violent attacks on civilians and innocent people," she said. She said Australia is working "very closely" with the Philippines, as well as Indonesia and Malaysia, against terrorism, "to ensure that we share information, intelligence, law enforcement and security and defense, and border protection."